The political debate about public spending in the UK is bedevilled by myths and spin about how much we actually spend. So I thought it was time for a little myth-busting primer, with some pretty diagrams, about how we should be discussing public spending…. There are three main ways of measuring public spending, each of which has advantages and disadvantages. The first is in what is technically called the “nominal” amount spent – that is in actual cash that goes out of the Treasury coffers. Because of the effects of inflation, this nearly always rises (see Figure 1). Only twice in the past half century has the cash amount fallen – in 2000-01. It is forecast to fall again, for one year only, in 2012-13. This is useful to some who want to argue that the State spends too much – for example some right-wing Conservative politicians and think-tanks currently claim that we are not experiencing “cuts” because the actual amount of cash being spent by the government continues to rise. Figure 1 makes it look like the State is an ever-increasing devourer of resources. But if inflation in prices is taken into account, things look a bit different. Real-terms spending is the amount spent with inflation taken into account. Real-terms spending shows a far less dramatic increase than nominal spending, and some periods where spending levelled-off or even decreased. It shows, for example, a significant (mainly forecast) decrease in real-terms under the current Coalition government. Again though, this way of looking at public spending can make it look like the State is a more-or-less ever expanding beast soaking up more and more of the nation’s wealth. This may, or may not be true – but the only real way of knowing is by seeing how public spending compares to nations wealth. Gross Domestic Product (GDP) is the main measure used by governments and others to estimate how wealthy countries are. There are many criticisms of GDP measurement, which we won’t go into here, but it’s the best we have at the moment for tracking growth (or lack of it) in our won economy and comparing our economic performance with other countries. Public spending as a proportion of GDP has thus become the main, and most useful, way of tracking how much our national wealth we devote to public activities as opposed to private enterprise. It’s main fault is obvious: because it is a ration of public spending and GDP a sudden change in GDP can easily look like a sudden change in public spending. Thus, for example, it looks like public spending suddenly sky-rocketed in the last three years of the last Labour government (see Figure 3) – whereas in fact (in real-terms – see Figure 2) it only increased slightly. The sudden change from 40.7% of GDP to 47.3% was almost entirely due to the recession the UK experienced as a result of the Global Financial Crisis (GFC). Public spending as a proportion of GDP has averaged just under 43% of GDP (42.76% to be more precise) for the past 50 years. 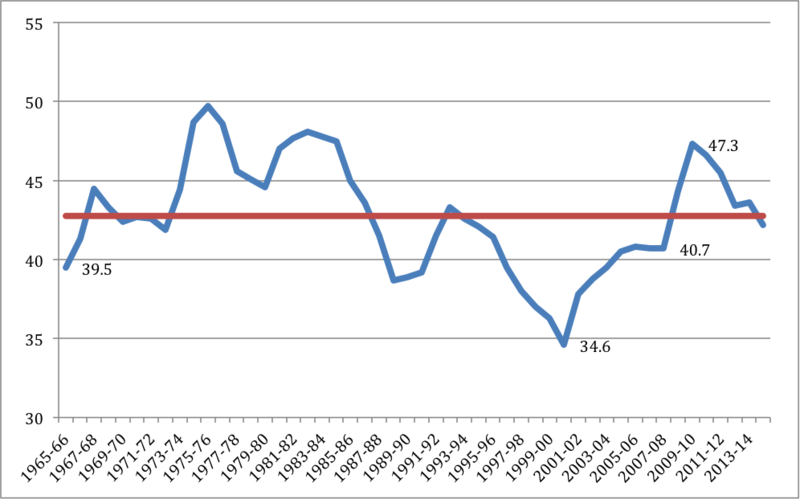 It has swung between as high as 50% (under Labour 1975-76) and as low as 35% (also under Labour in 2000-01). But what a detailed analysis of these figures shows is that some of mythology that passes for political “facts” in Britain is just that – myth. The first is that Labour is always the “tax and spend” Party whereas the Conservatives are far more thrifty with the public’s money. The facts are rather more mixed (see Figure 4). 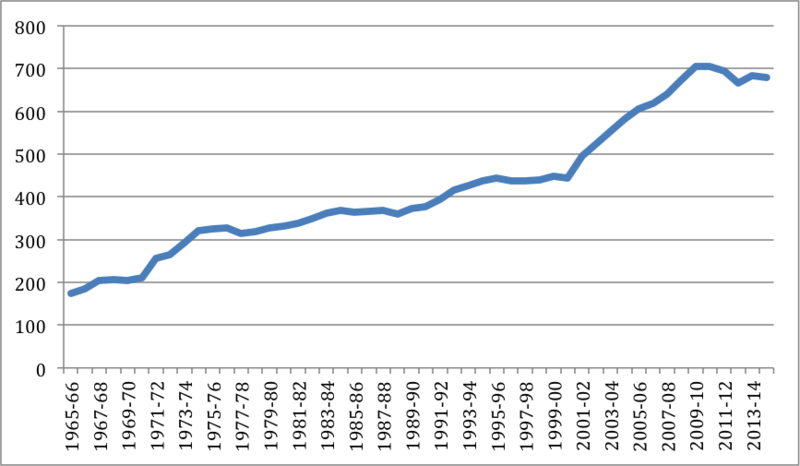 It is true that the 74-79 Labour Government spent on average more, as a proportion of GDP, than any other government in the past 50 years – but this is not true for the other periods of Labour government, when Labour spent less, on average, than the Conservative (or Conservative led) governments. In particular the widespread myth that the last “New” Labour government spent vastly more is just that – a myth. On average, even including the effects of the GFC, the last Labour government spent the least of the Governments since 1965. The myth has grown up because both Labour and their opponents wanted to promote the idea Labour spent lots. And because, especially between 2000 and 2005, Labour did rapidly increase spending – especially on health and education – but only after a period of unprecedented low spending between 1997 and 2000. This analysis only covers one aspect of public finances – spending – which is itself only one measure of how big the State is. But I hope it will help people to explain, and explore, some of the real issues about public spending rather than trading in myths and spin. [i] All the figures used in this analysis are based on Public Expenditure Statistical Analysis (PESA), published annually by HM Treasury. 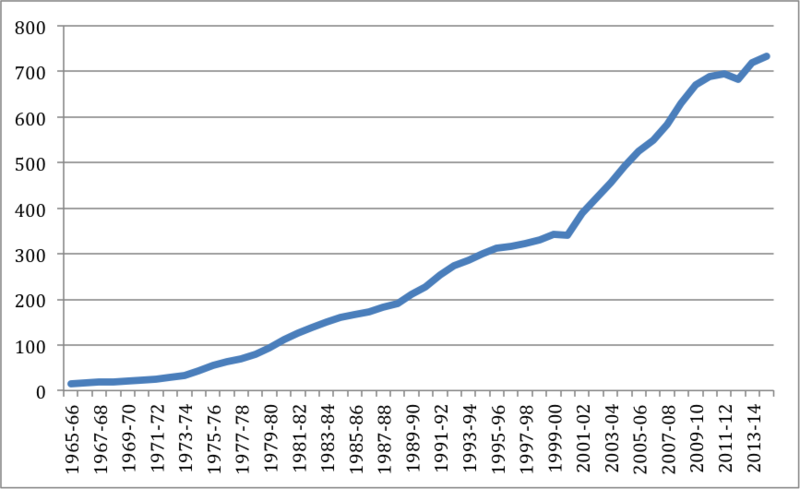 The figures for 1971-72 to 2014-15 are taken from PESA 2012. For 1965-66 to 1970-71 are taken from PESA 2003. Some of the calculations are my own, based on the HMT figures. Many things can and are claimed about the last Labour government but I think it is difficult to sustain the argument that its public spending was lower than any government since the 1960s. Figure 4 is not very accurate as it averages very different levels of spending within a government. What is clear from your figures is that in real terms spending under Labour was much higher and in some ways that is more illustrative than percentage of GDP which is dependent on the growth of the economy. Also as figure 3 shows, spending as a percentage of GDP was on a downward trend under the Conservatives but on an upward trend under Labour. 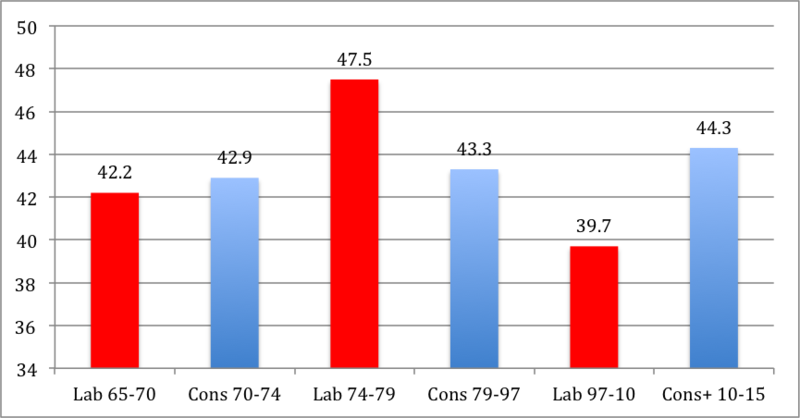 So Labour’s finishing point in 2010 was much higher than the Conservatives in 1997. Labour shackled themselves to Conservative spending plans for two years in 1997 and so in the context of a growing economy spending was bound to go down as a percentage of GDP but after the first two years spending increased rapidly, and as you say, especially in health and education. Unlike previous Labour Governments, after 1997 New Labour were not constrained by the danger of a run on sterling. @Martin Smith: Did you actually read the article as to why Diagram 3 shows “an upward trend”, as in the fact that the divisor (GDP) was falling sharply due to the recession? Xenaphon: Two points, the upward trend started well before the financial crisis. Second, this shows the limitations of using percentage GDP as a measure – it is not constant. In real terms, spending was increased by Labour much faster than trend. Nice article indeed Professor Talbot. However, shouldn’t the “actual” and “real” spend data be normalized for population growth? Overall, wouldn’t total government spending increase simply as a consequence of population increase? Similarly, a population’s changing age demographic will unavoidably impact spending, especially when its “average age cohort” grows increasingly elderly. Finally, @Martin Smith, the “spending” really started, albeit globally, when that village idiot G. W. Bush kicked off an illegal and uncalled for war in Iraq, all because “Saddam tried to kill his daddy”. Of course, that same adroit stewardship resulted in the US sub-prime mortgage, near implosion of AIG (largest beneficiary of TARP) and a near total collapse of the global financial system. This uniquely private sector created “Global Financial Crisis” required multi-billion $ and £ public sector funded bailouts and buyouts (aka spending) just to get national economies back from the brink. Would you have us believe the consequent spending was the fault of Labour and a profligate government ? I think Martin’s point about looking at the trend is absolutely valid. A new government inherits public spending numbers from its predecessor. We need to look at the trend to see what governments actually do when in power. 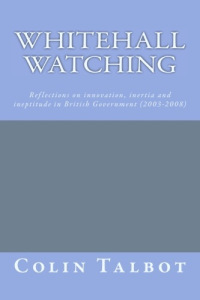 Figure 3 appears to indicate that under the Thatcher/Major governments, public spending as a percentage of GDP trended downwards at an approximate rate of 0.5 per cent per annum, while under the Blair/Brown governments, there was a rise in spending as a percentage of GDP of approximately 0.75 per cent per annum. I don’t have the actual numbers available, I’m simply looking Figure 3, so I my percentages may not be precisely correct, but they’re approximately correct. Under the coalition, public spending as a proportion of GDP is falling again. Whether higher or lower government spending is a good or bad thing is a matter of opinion. Rather than dispelling myths about the public spending preferences of different political parties, however, to my mind the trends shown in Figure 3 reinforce them. Thanks for the article and the graphs/data Colin.